Highly Concentrated Cranberry, 500 mg Cran-Max brand Cranberry Extract is made from 100% cranberry fruit solids, is patented and requires only one dose per day. A proprietary process intensifies the natural benefits of the whole cranberry without any solvents, preservatives, sugars, water, flavoring or color. Highly Concentrated Cranberry has 3 times greater antioxidant activity than cranberry juice and helps support urinary tract health. If you are pregnant, nursing, taking any medication, or planning any medical procedure, consult your doctor before use. For your protection, do not use if imprinted seal under cap is broken or missing. Keep in a cool, dry place, tightly closed. Serving Size: 1 Capsule. 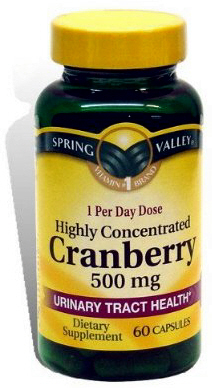 Amount Per Serving: Cranberry Extract (Cran-Max Brand) (Vaccinium Macrocarpon) 500mg. Other Ingredients: Cranberry Extract, Gelatin, Cellulose, Silicon Dioxide, Magnesium Stearate.